The publication 'Ballarat and Vicinity' starts its entry on James Bickett with 'One of the most interesting biographies in the whole of this work is that of Mr J.M. Bickett.' Scottish born James Bickett left school at around 8 years of age to work at Printfields in printing fabric, but continued to attend night school aimed at working students like Bickett. He sailed for Australia in 1848 on the 'Nelson', and was engaged on a sheep station at Kyneton - the first of many short term positions around Victoria. In 1851, when the NSW gold discovery was announced, Bickett took a boat to Sydney and walked from Bathurst to Turon where he mined for four months, until he received a letter informing him of the amazing gold discovery at Forest Creek (Castlemaine). Bickett and his party walked the entire distance to Forest Creek surviving on 'Johnny Cake' a kind of dough roasted on coals. The journey took 6 weeks, and the first hole they sunk resulted in 5 ounces of gold. They next followed the rush to Bendigo and did reasonably well. Bickett, now settled in the Ballarat district, Harrie Wood and Rogers agitated for the education of miners. 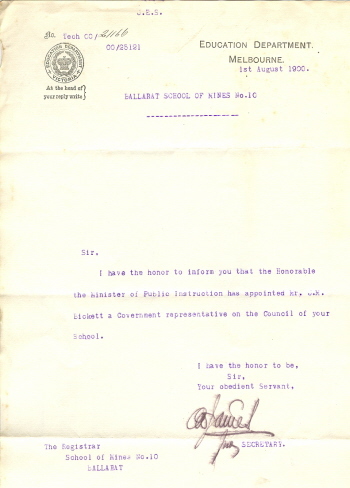 On 6 October 1869 a motion was put forward that a School of Mines be established in Ballarat. At this time the Ballarat Star reported Bickett's motion: "That a school be established at Ballarat, for the purpose of imparting instruction in mining and mining engineering. That such a school be under the control of a president, vice-president, and committee or council. That his Honour Sir Redmond Barry be solicited to accept the position of president, his Honour Judge Rogers be solicited to fill the position of vice-president; and that the committee or council be selected from local gentlemen best qualified for the position. That the president, vice-president, and committee or council, have power to prescribe the course of studies, to select and appoint instructors, to define their duties and emoluments, to engage lecturers, to fix the fees to be paid by students, and to have control of and disburse the funds of the school. That the committee of the Mechanics' Institute be solicited to set apart a room for the use of the school, and to supply it with works on mining, mining engineering, geology, and metallurgy. That a museum of mineral, models, plans, be established in connection with the school, and that the contributions to such museum be solicited. That a sum of money may be placed on the Estimates , to aid the establishment and support of such schools; and that the sum so granted may be payable to and be under the control of the committee or council of that school. That, if possible, the school be connected with the University of Melbourne, in such a manner that the students may be examined by professors of that university; and that credentials of competency may be granted by the university to such students as shall pass the examination. ... The motion by consent held over, and the chairman and Messrs Bickett, Downes and Eddy were appointed a deputation to wait upon Sir Redmond Barry, and ask him if, in the event of the board adopting the proposal to found a school, he would consent to assist in the project in any way that may seem to him good." 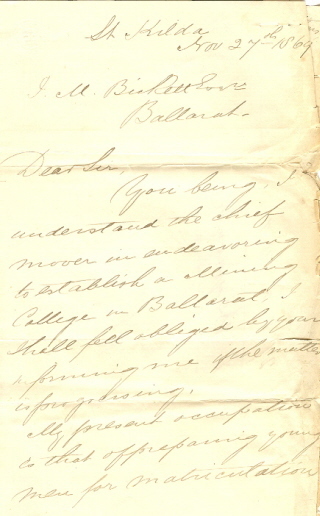 "Dear Sir, You being, I understand the chief mover in endeavouring to establish a Mining College in Ballarat, I shall feel obliged by your informing me if the matter is progressing. My present occupation is that of preparing young men for matriculation, the Civil Service Examination and lecturing in ladies schools on Physical Geography, etc. Now, were you to succeed in forming an institute for teaching mining, I believe that my special education could be made available. I studied for some time in the mining department of the Polytechnic Institute Carlsruhe (Germany) chiefly Technical Chemistry, Metallurgy, analysis of ores by humid and dry processes and blow-pipe analysis. From thence I went to [Gisson?] University under Baron Liebig, where I took my Doctor of Philosophy degree. On my arrival from Europe in Sydney, I gave several lectures on Chemistry and, of course I have vouchers for these statements and, if you think it desirable, I would visit Ballarat and lay them before you and other gentlemen interested. I need hardly say that if I were in any way connected with your undertaking I should 'go into the matter heart and soul" believing that the time has fully arrived when a mining school for Victoria is necessary.